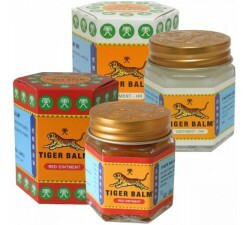 Red tiger balm is the original recipe, create for relieve strong pain. This balm is very efficient for sportsmen who want to warm up or calm muscles before or after exercise. Red balm gives hot sensation. You can use it for : rheumatism, muscular pain, tired feet. Red tiger balm effectively relieves muscle pain and / or joints that are related to sports, trauma or arthritis and rheumatism. The powerful ingredients have the capability to treat the swell, back pain, muscle sprain and other type of muscle discomfort. It can also be used to relax the tired muscles after a heavy body work out. A gentle massage on the skin will deeply penetrate into the skin layers which will relieve the pain. 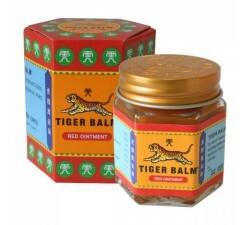 The tiger balm red brand is the original product invented by Aw Chu Kin, Chinese herbalist living in Burma in the second half of the 19th century. It is thanks to its efficiency and its unique design using natural products that has been so successful in the world and was then declined in different forms (which we also offer). 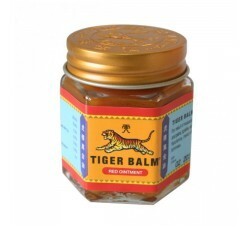 Red tiger balm is specially prescribed for people with muscle and joint pains. This balm will also improve blood circulation and thus better oxygenation of the muscles.